Youngsville’s Naomi Swartzbaugh leaps over one of the final hurdles in the 100 hurdles during a meet with Eisenhower at Youngsville High School, Tuesday, April 9, 2019. Swartzbaugh shattered the school record she set last year at districts as she blazed the track for a time of 14.8 seconds. Eisenhower swept the track and field edition of the Backyard Brawl at Youngsville Tuesday. The girls won 89-52, with the boys coming away with a 94-47 win. The Lady Knights had to overcome a record-setting Eagles performance on the track, but pulled away by dominating the field events. The boys did most of their damage on the track. Youngsville seniors Naomi Swartzbaugh and Jocelyn Taydus got the Eagles off to a flying start, almost literally. They finished 1-2 in the 100 hurdles with both coming in well under the school record for the event. Swartzbaugh set the record last year at the District 10 meet with a 16.45. Taydus came in nearly a full second under that at 15.5, while Swartzbaugh absolutely shattered it with a 14.8. For perspective, those times would have been good enough for fifth and seventh at states last year. “They worked hard this winter,” Youngsville coach John Victor said. 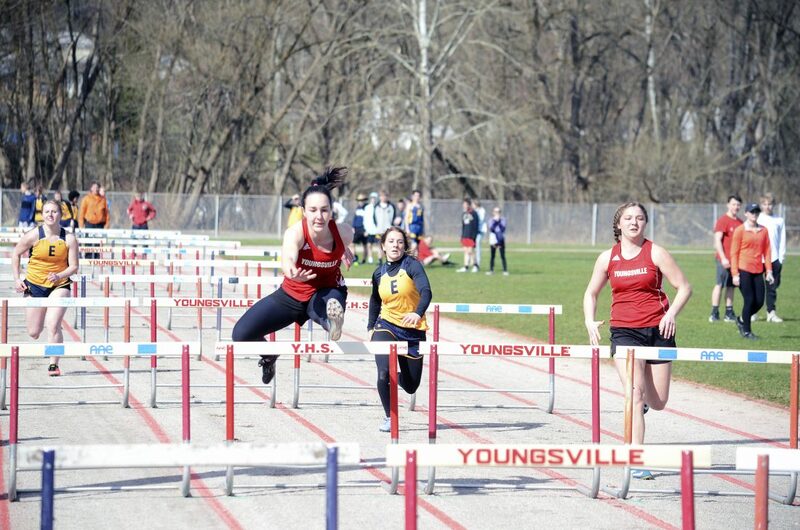 Swartzbaugh also won the 300 hurdles and the 100 and Taydus had a first-place finish in the 200. Julia Bojaczko was also a dual winner, taking first in the 1600 and 3200. Mia Rafalski won the high jump for the Eagles’ only top finish in the field events. The Lady Knights swept the relay races and also got first place finishes on the track from Patricia Bortz (400) and Aleea Giese (800). In the field, the Lady Knights took over. 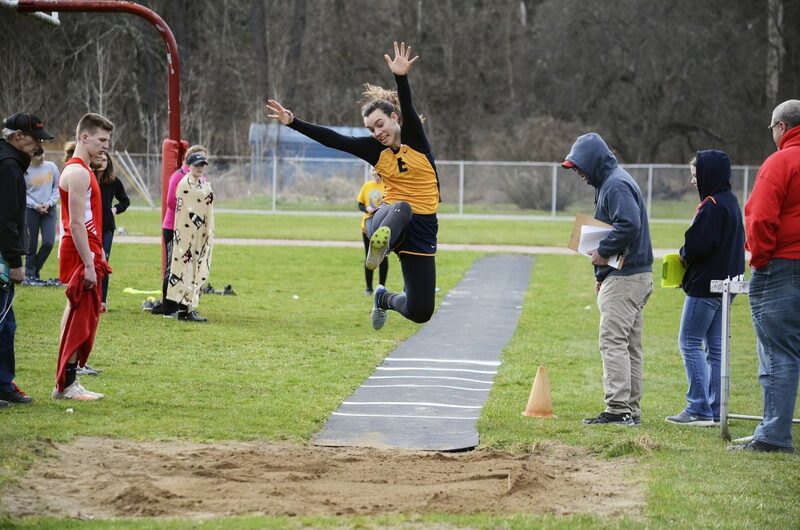 Lydia Giannini won the shot and discus, Currie Hultman took first in the javelin, Emiley Wheeler won the triple jump and Delaney Nizzi took top honors in the long jump. It wasn’t just the first-place finishers either. Eisenhower took two of the top three spots in every field event minus the high jump. Eisenhower’s Riley West passes the baton to Nate Holt in the 4x100 relay during a meet at Youngsville High School, Tuesday, April 9, 2019. The Knights won the event and swept the dual meet over the Eagles. Eisenhower’s boys ran away from Youngsville on the track. 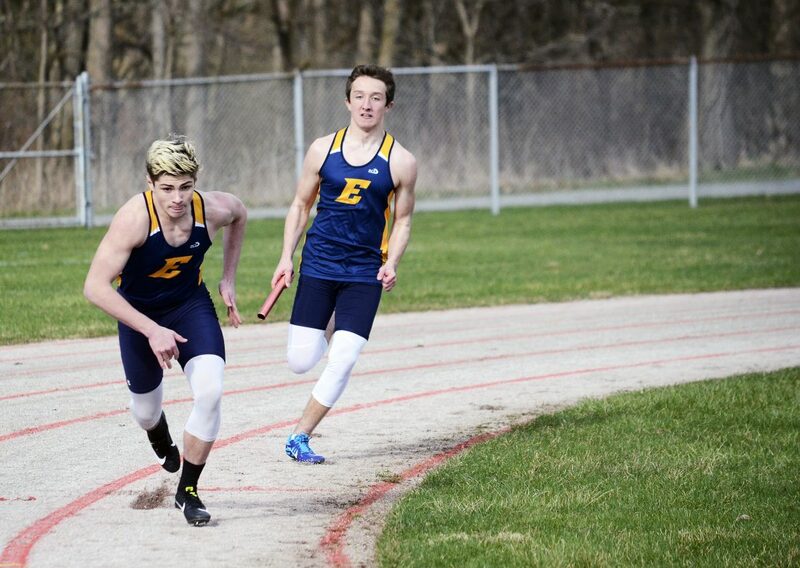 The Knights got individual wins from Caleb Robinault (200, 400), Jared Martone (100), Alex Hummell (800) and Nate Holt (300 hurdles) in addition to sweeping the relays. Joe Bauer picked up a pair of field wins in the shot and discus. 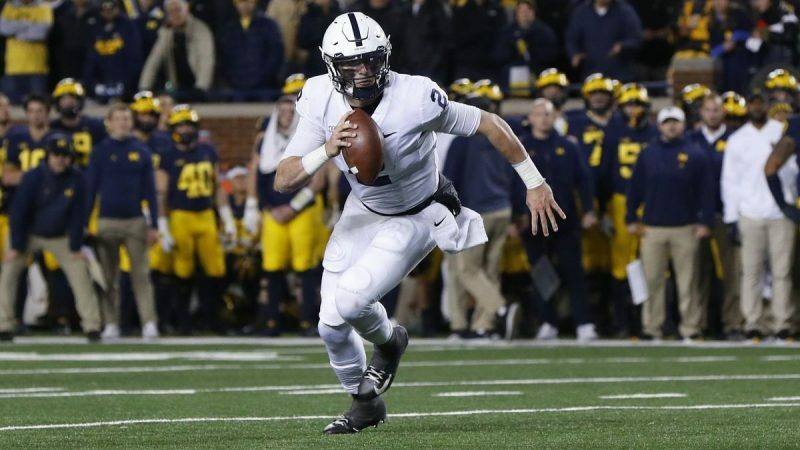 Sophomore Jake Hogg picked up right where he left off in a phenomenal freshman campaign. 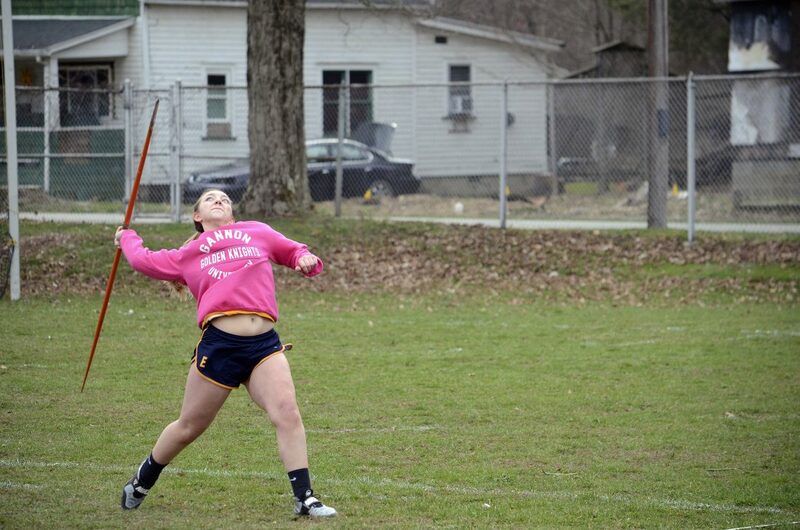 Hogg won all three jumping events and took first in the javelin. 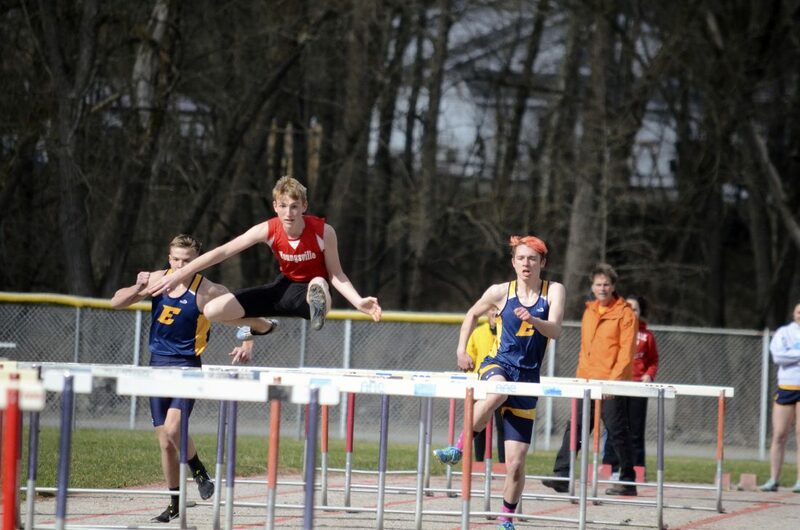 On the track, Mik Fehlman won the 1600 and 3200 and Austin Fitzgerald won the 110 hurdles. 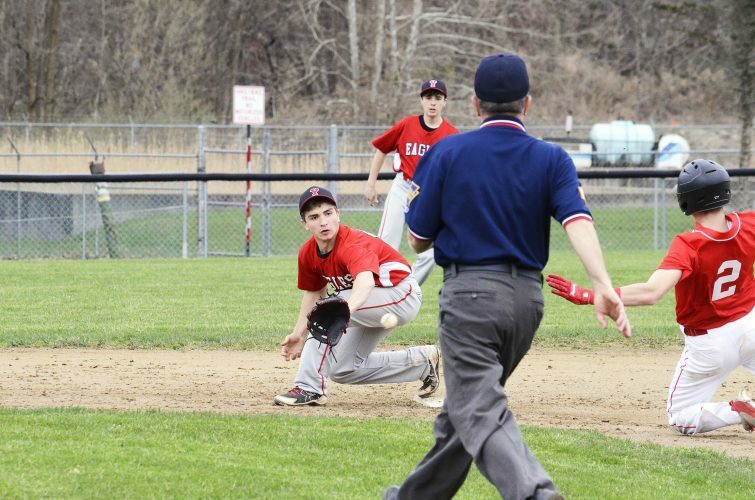 Eisenhower travels to Smethport Thursday, while Youngsville is next in action Saturday at the Fairview Invitational. Youngsville’s Austin Fitzgerald leaps a hurdle during a meet with Eisenhower at Youngsville High School, Tuesday, April 9, 2019. Fitzgerald won the event, but the Knights came away with the dual meet sweep over the Eagles. Eisenhower’s Emiley Wheeler flies through the air for a long jump during a meet with Youngsville at Youngsville High School, Tuesday, April 9, 2019. Wheeler finished second in the event as the Knights swept the Eagles. Youngsville's Gage Hendrickson throws the discus during a dual meet with Eisenhower at Youngsville High School, Tuesday, April 9, 2019. The Knights swept the Eagles. Eisenhower’s Riley West passes the baton to Nate Holt in the 4×100 relay during a meet at Youngsville High School, Tuesday, April 9, 2019. The Knights won the event and swept the dual meet over the Eagles. 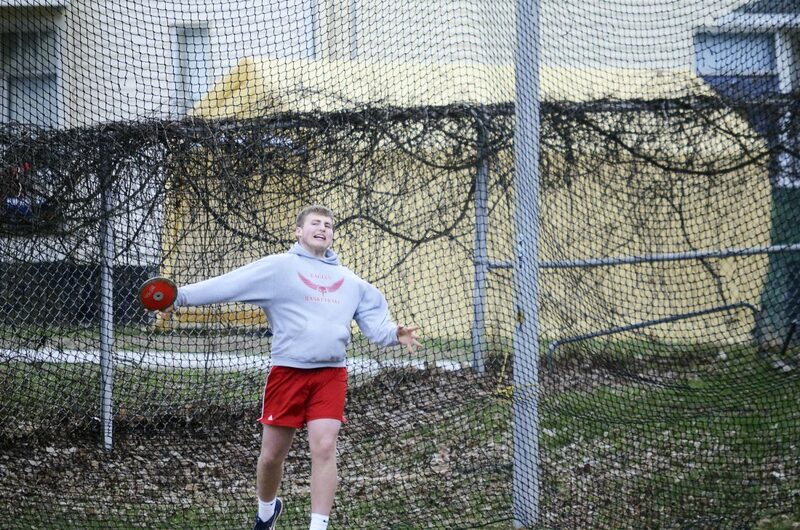 Youngsville’s Gage Hendrickson throws the discus during a dual meet with Eisenhower at Youngsville High School, Tuesday, April 9, 2019. The Knights swept the Eagles.